Make cake according to box. Add vanilla and chocolate chips. Preheat over to 375 degrees and bake cupcakes 20 minutes. Once cooled cut cones out of the tops (see pictures) for fillings. To make the cookie dough filling, combine the butter and sugar in a mixing bowl and cream on medium-high speed until light and fluffy, about 2 minutes. Beat in the flour, sweetened condensed milk and vanilla until incorporated and smooth. Stir in the chocolate chips. Fill holes made in cupcakes immediately and top with cone (filling will be sticky but easier to manage). Frost the filled cupcakes as desired, sprinkling with mini chocolate chips or topping with mini chocolate chip cookies for decoration. These look delicious! But SO much goes into them haha. I'm kind of lazy when it comes to baking. It was amazing how easy they were. 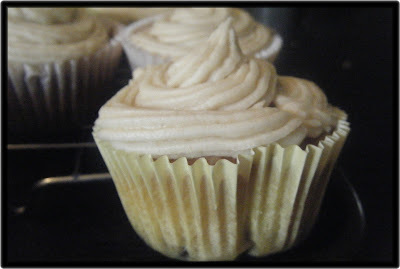 You could always go with a store bought frosting (I'd say stick with a vanilla)...and I've thought about the center (in my opinion these were SUPER sweet) but I think instead of cutting a whole and putting it in the center you could smear a layer on the top of the cupcakes (under the frosting) to give it the same flavor profile.